One of the things I like best about working from home is getting to spend all day with my Lab mix, Rio. Much of the time he sleeps under my desk, but he also seems to magically know when I need a laugh -- there's nothing like feeling stressed about a deadline, hearing a grunt, and locking eyes with an upside-down dog. Rio also lets me know when it's time to step away from the computer and take a walk together. Otherwise, like so many other Americans, I could be glued to my laptop and devices all day. So I was excited to learn on June 26, Take Your Dog To Work Day, that Purina is spearheading a "Pets at Work" movement to encourage businesses to consider becoming pet-friendly. 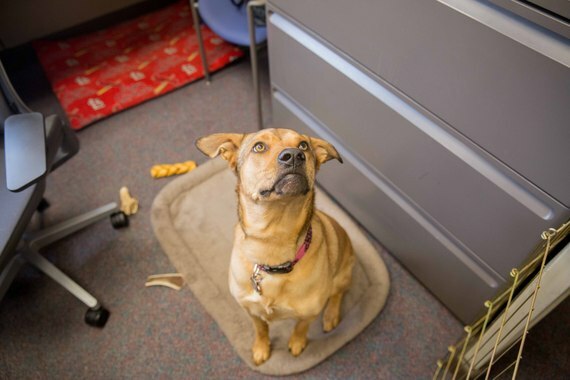 Kurt Venator, DVM, PhD, a veterinarian with Purina who also works as a relief veterinarian in upstate New York, told me that pet-friendly workplaces offer benefits to employees as well as employers. "We know that studies have shown that employees who bring their pets to work tend to have lower stress levels at the end of the day. That's pretty important -- it speaks to health and well-being," Venator said. "We also know that having pets can do a number of positive things, such as reducing blood pressure, decreasing loneliness, helping to lower cholesterol and encouraging physical activity." He said pets at work encourage co-worker interactions as well as healthy lunch breaks. "Obviously, you're going to want to take your dog out for a walk in the middle of the day," he said. "It gives you a nice little break to stretch your legs and get some oxygen in the lungs." Employers of pet-friendly businesses benefit with increased productivity from workers and improved job satisfaction, which helps with employee retention, he said. In fact, Purina runs internal surveys that regularly show employees view pets at work as an important benefit. 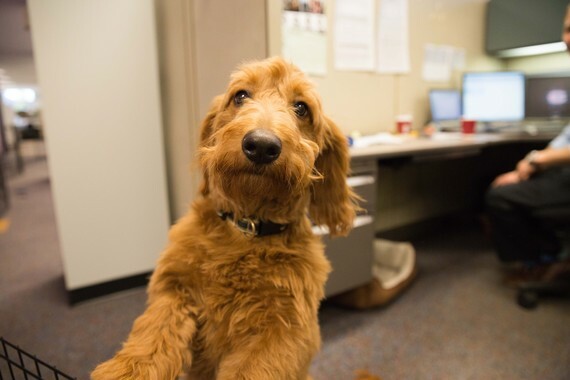 Venator said he thinks the survey results will help fuel momentum for the Pets at Work movement, and that employees and employers can download a free toolkit on Purina's website to help make their workplace pet-friendly. "I also think as a veterinarian and working with dogs around the country that it's also a benefit for the pets as well, in terms of companionship and their overall happiness," he added, noting that he loves working at home with his three yellow Labrador retrievers Sailor, Chance and Thatcher. Ultimately, Venator said the Pets at Work movement is a reflection of the deepening human/animal bond over the past few decades. "Within the last 20-30 years, we've watched pets move from the backyard to the kitchen to the bedroom," he said. "For me, it's a beautiful thing. It's a win for everyone." 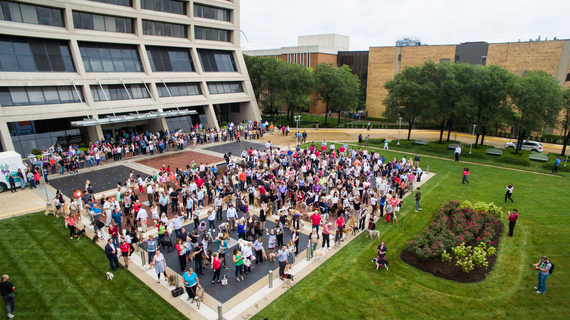 Purina employees gather with 281 pets on Take Your Dog to Work Day at the company's St. Louis headquarters. Photo courtesy of Purina. 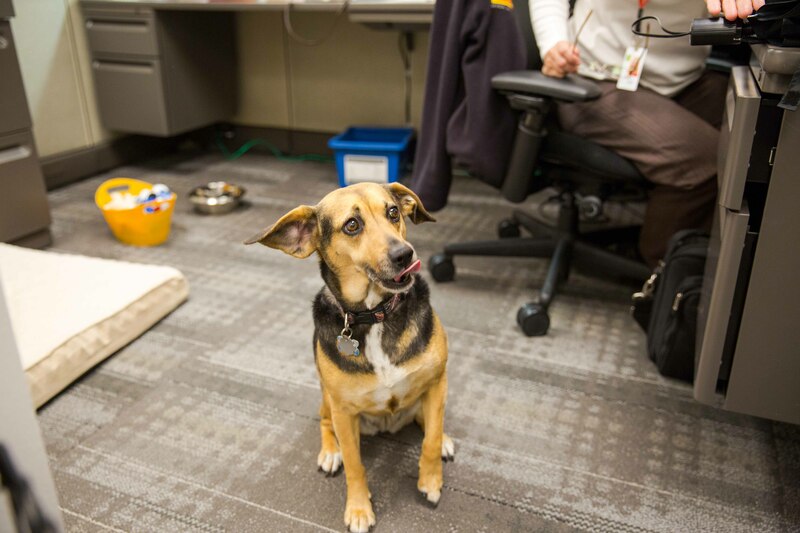 To download the free employer or employee toolkit for creating a pet-friendly workplace, visit https://www.purina.com/better-with-pets/pets-at-work.